It may be months away, but it’s never too early to block your calendar for the Solano Wine & Food Jubilee which returns to the Nut Tree Plaza in Vacaville May 18, 2019. The 32nd annual event promises to deliver all the good food, wine, brews and socializing that ticket holders have come to expect. It also represents philanthropy at its most compassionate, as funds raised through the Jubilee continue to support the programs of NorthBay Hospice & Bereavement, helping patients and their families as they face an end-of-life illness. One way to ensure you have tickets to the Jubilee is to become a sponsor, and the earlier you commit, the more advantages you will receive. Sponsorships start at $1,500 and can go up to $20,000. Not only will the sponsorship provide a tax deduction, but if agreed to before Dec. 31, 2018, the sponsor is guaranteed at least two seats to Open That Bottle Night, set for Feb. 23, 2019. This by-invitation- only gala is an elegant evening celebration of support for 300 people. 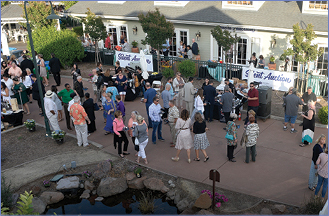 Sponsors are also placed on a Jubilee VIP list, which includes access to special pre- and post-event receptions and to the Jubilee venue itself an hour before general admission.